Disclaimer: Mulder, Krycek and Scully belong to Chris Carter, Ten-Thirteen Productions and 20th Century Fox. The show "Jackass" belongs to MTV. We see MULDER, KRYCEK, and SCULLY's messy apartment, as if we are standing at the front door, looking in. MULDER and KRYCEK and relaxing on the couch as usual, watching tv. MULDER~ (exclaiming, his mouth full) I swear, man....this is the *best* show ever invented! Crumbs spray out of his mouth onto KRYCEK, who is laughing his head off. KRYCEK~ (high fiving MULDER, ignoring the crumbs) Agreed! Camera shows the tv screen. MULDER and KRYCEK are watching "Jackass". MULDER~ (swallowing) Hey, I'll bet anything *I* can get on that show! KRYCEK~ (rolling eyes) Yeah, right! I know you're stupid, but not stupid enough! KRYCEK~ (narrowing eyes) Yeah....I'll bet Rule Number One and a box of animal crackers, plus my Nirvana cds, you'll never be on "Jackass"! They shake hands, as SCULLY enters through the front door, carrying a grocery bag. MULDER~ (determined) Okay, you're on! SCULLY~ (suspicious) What's going on in here? I just heard your laughing all the way down the hall! MULDER and KRYCEK turn to each other with startled expressions on their faces. KRYCEK~ (whispering) Should we tell her? MULDER~ (more loudly than he should speak) No! This is gonna be our little secret! SCULLY hears what MULDER just said and gives them both a dirty look. SCULLY~ (rolling eyes) Whatever....you boys *really* need to grow up. She leaves the room, heading into the kitchen with her grocery bag. Camera zooms in on MULDER and KRYCEK looking in SCULLY's direction, as they burst out laughing again. We see the inside of a supermarket through a shaky, hand held camera (a la Blair Witch). MULDER appears in view, wearing a Rugrats bedsheet around his shoulders, a long woman's skirt, and swimming goggles. We zoom in on his face. MULDER~ (flexing his arms) Pinto Bean Smash! 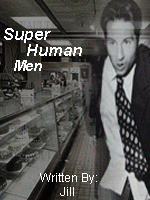 Still in the camera's view, filmed by KRYCEK, we see MULDER grabbing a bag of pinto beans. The bag of beans goes flying. In slow motion, the beans come falling down....onto MULDER's head, crashing to the floor! Beans explode from the bag. KRYCEK turns the camera to face him. KRYCEK~ (into camera) Uh, oh!!!! MULDER grabs the camera, and we now see what he films. They race through the supermarket, knocking over horrified customers, food, and anything else in their way. Running straight through the automatic doors, they do not stop until reaching the parking lot. MULDER turns the camera to face him. MULDER~ (out of breath) That, my friends, is my favorite game! MULDER and KRYCEK are lounging on their couch again, in front of the tv. SCULLY is nowhere to be seen. KRYCEK~ (hysterical) I can't believe what those losers are doing! MULDER~ (rolling on the floor, laughing uncontrollably) What idiots! They have *no* lives! The camera pans to the tv screen....Unknown to them, MULDER and KRYCEK are watching *themselves* playing Pinto Bean Smash....on "Jackass".